Introduction: V-process or vacuum molding which was developed by Japanese using unbonded sand and vacuum is a perfect substitute for permanent mold and die casting process. Now the process is employed worldwide as an effective method to cast quality products in start up and low to medium job. The most highlighted feature of vacuum molding is that the flow of molten metal can be controlled. Process: Patterns are mounted on plates and boards, which are perforated, and each board is connected with a vacuum chamber. Unbonded sand is used for the molding purpose. Permeability is not a concern in this casting process, therefore sand of the finest structure can be used. The vented, plated pattern is coated with a layer of flexible plastic, which expand when the vacuum is applied in the mold. Enabling, the pattern to be stripped easily from the mold. Patterns should be perfectly smooth since in vacuum molding, every small intricate design gets imprinted on the cast. The pattern are not damaged during the process so they can be uses repeatedly. In the vacuum molding process the mold are made is two parts (cope & drag) with each parts attached with its vacuum chamber. The pattern is kept and a metal or wooden flask place around it. Unbonded sand is poured over the molding box, and the tables is shaken vibrantly, by which the sand particle become tight and compact. Another layer of plastic sheet is draped over the molding box. The two halves are joined. Now the vacuum is formed through the patter. The vacuum makes the sand strong and the pattern coating expands, which makes it easy to strip the pattern from the mold. The mold in kept in a housing and placed above a furnace of molten metal. 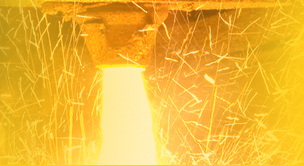 Using sprue or gating the mold is connected inside the molten metal. When the vacuum from the mold is evacuated the molten metal gets forces into the mold, because of the difference in pressure that is created between the outer atmosphere and the mold. The plastic sheet melts and the mold is filled with the molten metal. After the metal solidifies and cools, the vacuum is released. The sand mold starts to fall apart as the solidification process completes. This sand can be cooled and reused for further casting process. The power of vacuum: In mid 1600,Otto von Guericke a German mayor and scientist conducted the first experiment to prove the power of vacuum. He joined two large copper hemispheres and evacuated the air out of it. Now, eight horses were hooked on opposite side of the hemispheres. The horse pulled the hemisphere is two different direction, but the ball could not be torn apart. Guericke then let in air and the hemisphere came apart. In this way he proved the power and possibilities of vacuum. Application : Vacuum molding process can be used to cast industrial components from both ferrous and non-ferrous metals. 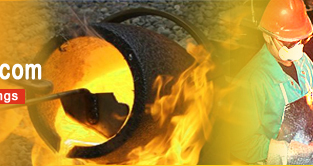 Casted products have high dimensional accuracy and surface finish.